SOUTHWEST FLORIDA(DISTRICT IX)LOCAL EMERGENCY PLANNING COMMITTEEAugust 23, 2012MEETING MINUTES SUMMARYThe Southwest Florida Local Emergency Planning Committee (LEPC) met in Fort Myers at theoffices of the Southwest Florida Regional Planning Council, 1926 Victoria Avenue, Fort Myers,Florida 33901. 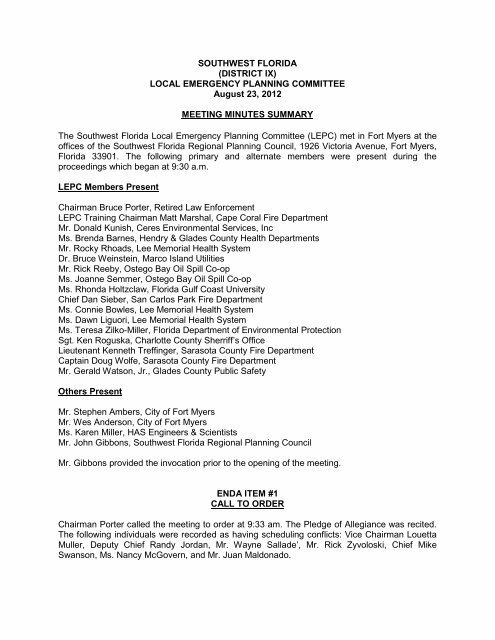 The following primary and alternate members were present during theproceedings which began at 9:30 a.m.LEPC Members PresentChairman Bruce Porter, Retired Law EnforcementLEPC Training Chairman Matt Marshal, Cape Coral Fire DepartmentMr. Donald Kunish, Ceres Environmental Services, IncMs. Brenda Barnes, Hendry & Glades County Health DepartmentsMr. Rocky Rhoads, Lee Memorial Health SystemDr. Bruce Weinstein, Marco Island UtilitiesMr. Rick Reeby, Ostego Bay Oil Spill Co-opMs. Joanne Semmer, Ostego Bay Oil Spill Co-opMs. Rhonda Holtzclaw, Florida Gulf Coast UniversityChief Dan Sieber, San Carlos Park Fire DepartmentMs. Connie Bowles, Lee Memorial Health SystemMs. Dawn Liguori, Lee Memorial Health SystemMs. Teresa Zilko-Miller, Florida Department of Environmental ProtectionSgt. Ken Roguska, Charlotte County Sherriff’s OfficeLieutenant Kenneth Treffinger, Sarasota County Fire DepartmentCaptain Doug Wolfe, Sarasota County Fire DepartmentMr. Gerald Watson, Jr., Glades County Public SafetyOthers PresentMr. Stephen Ambers, City of Fort MyersMr. Wes Anderson, City of Fort MyersMs.  Karen Miller, HAS Engineers & ScientistsMr. John Gibbons, Southwest Florida Regional Planning CouncilMr. Gibbons provided the invocation prior to the opening of the meeting.ENDA ITEM #1CALL TO ORDERChairman Porter called the meeting to order at 9:33 am. The Pledge of Allegiance was recited.The following individuals were recorded as having scheduling conflicts: Vice Chairman LouettaMuller, Deputy Chief Randy Jordan, Mr. Wayne Sallade’, Mr. Rick Zyvoloski, Chief MikeSwanson, Ms. Nancy McGovern, and Mr. Juan Maldonado.